This hazelnut, a.k.a. filbert, was so full of bees yesterday that it sounded like a swarm had landed. The filberts blooming here are mostly the cultivated varieties; the native filberts seem to be a little more reticent. I’ve also spotted a few scattered dandelions, hellebores, witch hazels, sarcococca, and snowdrops, but I suspect that the avalanche of bright yellow pollen coming into my hives this weekend was from the filberts. I like this post more than your last. Although I can relate more to the last, as I have a similar colony. One without a queen. But as yet no robbing. A filbert tree in bloom is much more inspiring to me than a colony without a queen in early spring. But thanks much for sharing both. Your post about hive robbing scared me, so I watched the activity of my 2 hives and though there was a lot of activity I saw bees going into both hives laden with big yellow sacs. I couldn’t figure out what they were carrying or where they were getting it but it seemed good. Sorry to panic you! Pollen is definitely good…it keeps the bees busy collecting (not from each other), and it’s a good sign that they’re raising baby bees. Hefting your hives to see how well-stocked they are will also give you an idea of whether you need to supplement with sugar. I’m inclined to think a weak, hungry hive is more prone to rob or be robbed. Sounds like things in your yard are going well, though. Hurrah! Wow, I am jealous of your filberts. It has been so warm up here past Shotgun Creek in the Mohawk River Valley, but our filberts are only showing promise of flowers. The bees are still harvesting conifer sap. 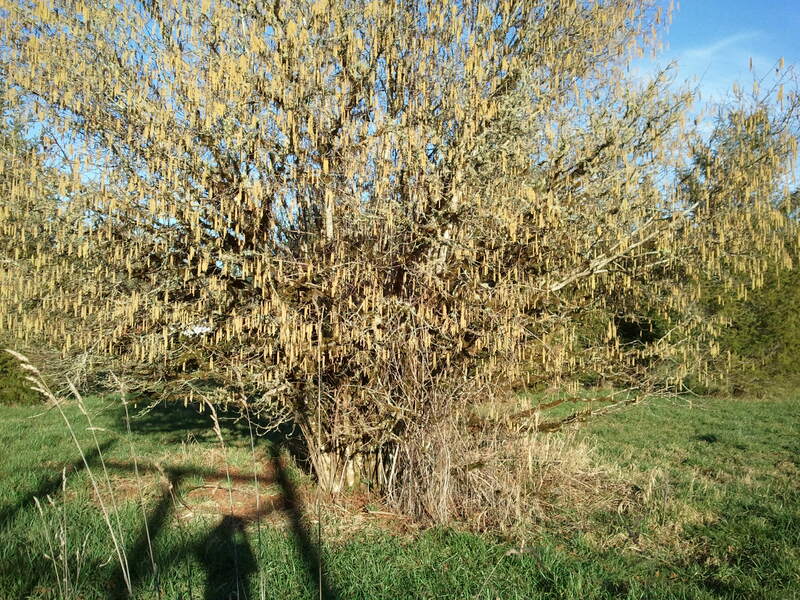 The forsythias and osa berries are about to bloom. It’s great to hear what’s happening in your neck of the woods! Our osoberries (Indian Plum) are getting nice fat buds on them, but no bloom yet. Same for the native filberts. Horton is at an elevation of about 830 ft.; our bloom is typically a good two weeks behind the Willamette Valley. What is your elevation at Shotgun Creek?